The Big IdeaThe message of the Early Years is that we are most capable of learning until the age of 6. Underpinning this message is the idea of "plasticity". This is not news. What might become news is if we find out what to do with this knowledge. For the problem is that we have not known what to do about this knowledge. We have not known how to move from concept to action? Until now. We believe that the research has now come together to provide us with a clear direction and a clear focus. If we focus on the acquisition of vocab by the age of 2 and its drivers the amount and quality of conversation and the amount and timing of touch we believe that we will have resolved the gigantic complexity of the early years into a field narrow enough yet powerful enough to get movement. This series of articles will explore this proposition and link the separate areas of research into a coherent and self supporting whole. Our brains and our world view are open to many choices at birth but by 3 many of the alternatives and the trajectory for our future development is largely set. By the age of 2 the size of our vocabulary will indicate how we will be able to learn all the way through school. This slide shows us a dramatic picture. Vocab is a powerful and measurable predictive factor. If we measure an infant's ability to understand vocabulary at 2 we can get a strong sense of the development trajectory for life. 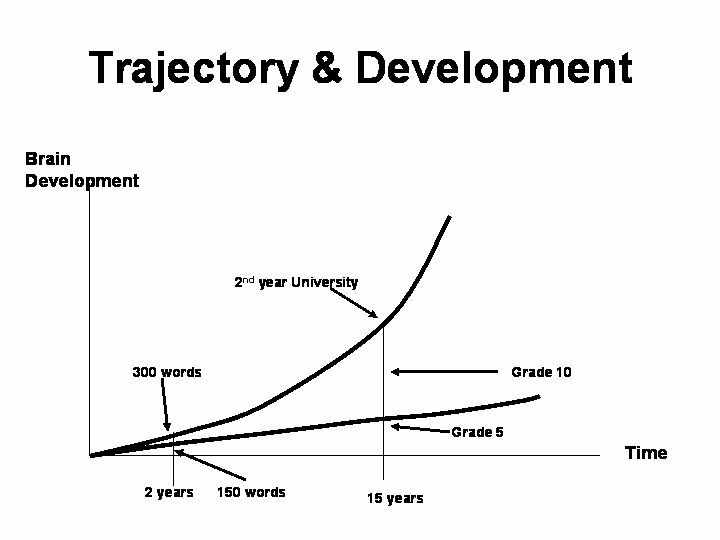 Much of the research now informs us that by 4 the vocab trajectory is largely set. Infants with a vocab of 150 or less will normally develop on a very shallow trajectory reaching by grade 10 an ability of grade 5. 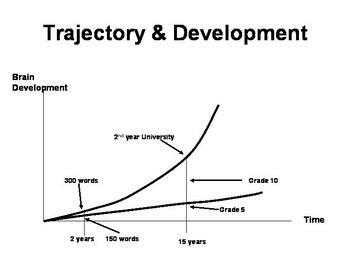 At the other end of the scale, infants with a vocab of 300 words will be on track for an exponential trajectory leading to a vocab of a 2nd year university student in grade 10. This revelation about the predictive power of vocab attainment raises the issue of the idea of Trajectories and when they are able to be influenced. Chaos theory tells us that "Initial Conditions" are the most powerful element in how systems unfold. It is likely that vocab attainment in the Early Years represents the measure of the Initial Conditions of human development. The impact of this ideaThis insight has huge implications for how we as a society consider our current investment in the education system that begins age 6. We have enormous faith in schools - after all we all went to them and they have become the centrepiece of how we "see" education. But as we begin to understand the idea of trajectories for learning and for behaviour School Readiness takes on a new importance. Why is this so important? 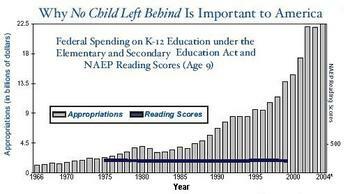 Because we are finding it very difficult to alter trajectories in school once they are set. US data suggest that even the application of extraordinary resources in school cannot change the shape of the development curve. The main work has to be done before our children arrive in school. So we have quite a shock. We have thought that our schools were going to be the key to our children's future and we find that it is our job as parents. Our development in the Early Years is not only confined to our ability to learn. Our world view is set then as well which sets up our norms for behaviour and the boundaries for our coping skills. Consequently, many of the drivers for our future health, such as the capacity of our immune system, are also laid down in this period as well. By 4 we will have acquired life-long eating preferences that will be hard to change throughout life. By 4 our athletic skills and our desire to take exercise will largely be set. So we are beginning to understand that the Early Years encompass issues that extend beyond literacy to include obesity and activity: in fact for a health trajectory for life as well. As with schools, we currently pour most of our society's resources into a healthcare system that does its best to fix an ever expanding litany of chronic disease such as type 2 diabetes, complications from inactivity and poor diet etc. Many of our addictive behaviours such as smoking are also strongly influenced by world view and family culture. It is clear that the trajectory for much of the chronic illness we suffer from today is set in the Early Years. Fixing poor life time habits is an exceptionally challenging job for both the individual and for the healthcare system. The only time that we are plastic enough to set habits is when we are very young. This is the responsibility of really understanding the meaning the Early Years. Our core experiences as humans that set up these trajectories occur inside the culture of our immediate family. This is scary news for parents. Scary because, until now, we did not know how powerful our interaction with our children would be. Scary because we thought that it was school that was going to make the big difference in learning. Scary because we thought that our doctor was going to keep us well. Scary because we don't know how to respond to this challenge. We thought that if we kept our children clean and safe and taught them how to behave that would be enough - society would teach our children and keep them well. In this context, what then do we have to know as parents to best prepare our children in the first 4 years of life? What might be the 1-3 simple things a parent could do that would help the most? It surely cannot be the 100 things. These things must be simple as well. If we can find out what are the 1-3 things that would make a large difference in how parents interacted with their children, how could society itself get behind parents to help in this work? Then what practical things could policy makers consider when seeking to improve overall societal development outcomes? And finally what could researchers focus on that would enable them to see if what we were all doing would be worthwhile? The social and economic context for this workHow important is it to find these answers anyway? Maybe it is just a few poor Canadians that have the problem? Regretfully not. We now know that the largest group of Canadians whose children are having development problems are middle class. 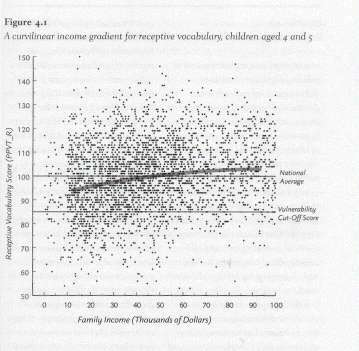 The chart shows the relationship between understanding vocab and income. We see that there are many children from poor families that are doing well and that the majority of children that are not doing well come from middle class income brackets. The "bottom line" in the slide is that fact that poor development is not confined to welfare mums. We are all involved. Wilms' great insight which is supported by Hart and Risley is that family culture is the egg and family income is the chicken. It is the behaviour and attitude of the parents that en-cultures the infant and sets the infant up on a series of trajectories. The stakes are high and time is short. In particular for Atlantic Canada where we do not have the benefit of high immigration rates and high birth rates. On PEI 42% of adults can only read at a level 3. 17% of Islanders cannot read. Consequently most Islanders cannot participate in the complexity of the modern economy. PEI and most of Atlantic Canada do not have enough high quality human capital to solve our social and economic problems. To be continued in the "Keys to the Kingdom"
It's not really what they say but what they understand that is the point of measurement. But most important of all is that the process is based on conversation what they have heard and what was the nature of the words - many kids just get ordered around - you conversed - it's a cultural reality.Do they feel engaged or an object or ignored. It's a new field but the evidence is there. I think we can look back at our primate past and see the root of all of this in grooming. Babies need a lot of touch too and this too seems to be a large factor in opening up their developmental pathways. I wouldn't want it to be interpreted that we should write children off at 6 if they haven't reached a certain level. Wasn't Einstein also dyslexic and a poor student? I have 3 daughters. My oldest spoke very early, and by 1 1/2 was speaking in sentences. Adults were sometimes taken aback, but one elderly lady said, "well, there's a child that has been talked to". I didn't realize until then, that it was true. From the moment they were born I was talking to them continuously - now we are putting on your pants, now we are putting on your shoes, now we are getting up, .....etc., etc. And reading, and singing and hugging, touching and cuddling. All 3 have developed large vocabularies, and a love of reading and writing. I think what children respond to is complete and undivided attention, even for only a portion of the day. (Probably good for the rest of us too) This is hard for busy parents, daycare providers and schools to give. Scary, indeed. Sorry I have not replied sooner but I am travelling. The issue is not speaking but understanding. How much does she comprehend? Some very bright children speak late - Einstein was very late. Then it all pours out. There are two pathways to help you. The first is to have as much touch as possible. Hold her as much as you can. The second is to converse with her - such as read to her with here in your lap. Ask her questions such as what is the doggie called or as you are dressing her point out that these are her shoes etc. The point behind touch and conversation is to spend as much time as possible being fully engaged with here so that she in in an emotional dance with you. I have a 2 1/2 old little girl who doesnt say over 25-30 words,and I am concerned. They doctors have checked her ears which were fine. She understands what is told to her. She can point things out in a book when told or asked. Should I be concerned and how can I help her to talk more?